Are all crystal lattices cubic? In other words, are all the three axes of the unit cell always the same length? No. 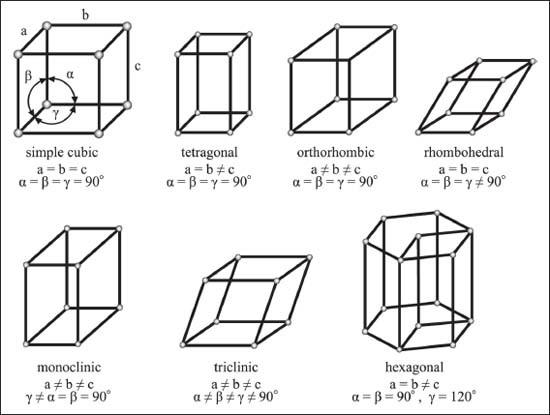 In fact, cubic is only one of the seven “crystal systems.” These systems are based on the lengths and angles of the unit cell. The cubic group has three sides of equal length, and all the internal angles are 90°. If one side is longer, we get a tetragonal lattice. If all three sides are different lengths, the lattice system is called orthorhombic. If one angle is not 90°, it’s monoclinic. If the angles are all equal but they’re not 90°, it’s a rhombohedral lattice. If the angles are all different and not 90°, the lattice is triclinic. Yes, you’re right, that’s only six. The seventh isn’t based on a cube at all. The hexagonal lattice system is (you guessed it) based on a hexagon.